Magnesium safety blocks can cause shrapnel when fractured. Steel safety blocks also has shrapnel issues for this type of application. 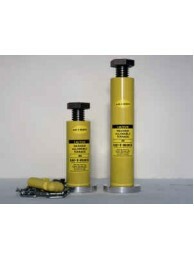 Aluminum Safety Blocks are an excellent replacement for out-dated or insufficient press blocks. 7" Lowered Height Adjustable Length Safety Block. 35 Ton Maximum Capacity. Available..
7.5" Lowered Height Adjustable Length Light-Weight Safety Block. 35 Ton Maximum Capacity. ..
8.5" Lowered Height Adjustable Length Light-Weight Safety Block. 35 Ton Maximum Capacity. ..
9.5" Lowered Height Adjustable Length Light-Weight Safety Block. 35 Ton Maximum Capacity. ..
10" Lowered Height Adjustable Length Light-Weight Safety Block. 35 Ton Maximum Capacity. A..
10.25" Lowered Height Adjustable Length Light-Weight Safety Block. 35 Ton Maximum Capacity..
10.75" Lowered Height Adjustable Length Light-Weight Safety Block. 35 Ton Maximum Capacity..
11.25" Lowered Height Adjustable Length Light-Weight Safety Block. 35 Ton Maximum Capacity..
11.75" Lowered Height Adjustable Length Light-Weight Safety Block. 35 Ton Maximum Capacity..
12.25" Lowered Height Adjustable Length Light-Weight Safety Block. 35 Ton Maximum Capacity..
12.75" Lowered Height Adjustable Length Light-Weight Safety Block. 35 Ton Maximum Capacity..
13.25" Lowered Height Adjustable Length Light-Weight Safety Block. 35 Ton Maximum Capacity..